One could say that sisters Elle and Shealeen Puckett were destined to be musicians and be involved in show business. The two grew up in a musical environment. Their parents were musicians who played in bands, and the home was filled with the classics. The entertainment genes were passed on to the sisters at a very young age. When they were 10 and 12, respectively, Elle and Shealeen would perform Elvis Presley covers at gas stations in order to raise money to buy candy. Through their adolescence, they would continue to play music – Elle the guitar and Shealeen the piano – while developing their songwriting. A few years later at seventeen and nineteen years of age, they were signed to label Tooth & Nail after one of their early demos was sent to the indie label giant. 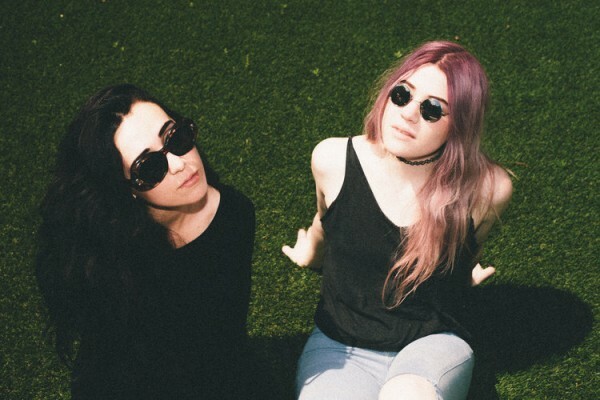 From 2009 to 2012, they would release two EPs and one full-length album under the name Poema. Their albums were very well-received within the Christian music scene, and the sisters’ popularity would soar. A year after the release of their debut LP Remembering You, the Puckett sisters moved from their hometown of Albuquerque, New Mexico to the music city of Nashville, Tennessee. In their new surroundings, they met new people and became exposed to a wider and more varied music scene. In 2014, they announced they were splitting from Tooth & Nail, opting to fully become an independent band. 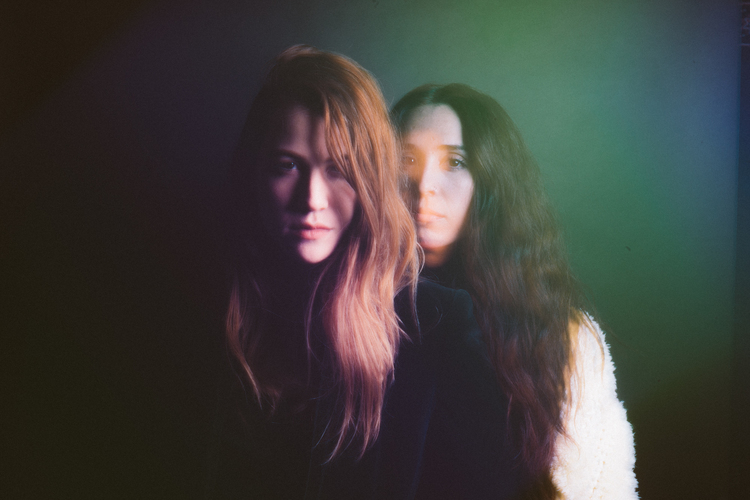 Whether the move to Nashville or other external influences were involved, what was clear was that the Puckett sisters were seeking an opportunity to show they could create music that reached a broader audience and must that was more expansive. With their new found autonomy, the Puckett sisters immediately went to work on a new album. The result is Pretty Speeches, which Poema self-released last week. Pretty Speeches a five-song EP that shows the duo have matured both lyrically and musically. Although many of the songs retain the focus of young love, the album also touches on other subjects (family, the passing of time). 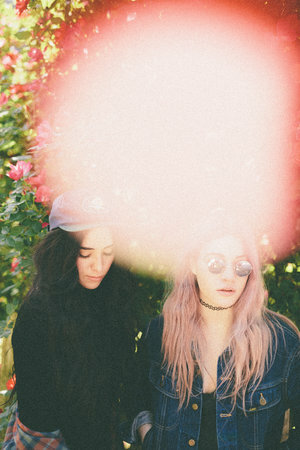 Musically, the album is at times lush and even quietly seductive, such as on “Go Away” and “Forget You in LA”. It is cool and laid back like the pop music of the ’70s, which is heard on “Enough Messing Around”. Nods to their hometown and their new residence can be heard in the soothing, melodic “Get to Me”. “Madeline”, which closes the album, is a piano-driven, solemn number. It is the thoughtful and introspective song on the EP, and it possibly tells the story of someone dear to the sisters. With the release of their first independent album, it was timely to catch up with Elle and Shealeen and hear their story. Not just the split from Tooth & Tail, but to hear about the Elvis Presley sessions to their experience in self-releasing Pretty Speeches. While the sisters are still quite young (in their early and mid-twenties), they are now music veterans, and Pretty Speeches represents a new step in the evolution and rise of Poema. Hello Ladies. Thanks for taking the time to answer some questions. First of all, who’s who and who does what? E: I’m Elle. I play guitar and sing. I’m also the younger sister. S: Shealeen. Keys and vocals. As sisters and having performed together for more than a decade, you obviously know each other extremely well. So what are some notable habits or tendencies the other one has when it comes to the songwriting process and performing on stage? S: She’s better at talking on stage than she gives herself credit for. On your website, the background section starts off explaining how you two sang Elvis covers at the gas station to earn enough money to buy candy. What were some Elvis songs you sang? Did you dress and move like The King? S: I’m pretty sure I was just there for moral support. I might have thrown in a background harmony or 2. That’s cool. Now the more important question about Elvis. Who does the better Elvis impersonation? S: I’m sure it’s her. She’s better at impersonations, although I’m the bigger Elvis fan! Great question! How did these “gas station” sessions help you grow as musicians, songwriters, and performers, if at all? After the Elvis impersonations, do you remember the first song you wrote and what was it about? Did you perform it in front of anyone? So how does the songwriting process now work between the two of you? Is there still a bit of a sibling rivalry/competition? S: Not really, we’re pretty like minded when it comes to writing. We honestly probably get along best when we’re making music hah. Your first albums were with Tooth & Nail. What was that experience like and what were some of the key lessons you learned? E: Our time with Tooth & Nail was a great learning experience. We had a lot of opportunities that we wouldn’t have had otherwise, and I’ll always appreciate that. S: Yeah, being signed isn’t an automatic ticket to success. You still have to put in the work! Now, you’ve independently released your new album, Pretty Speeches. First, congratulations! I have to ask, why self-release it and not stay with Tooth & Nail? E: Thank you! We decided to put out his record on our own as a learning experience. So far, it’s been a challenge. but it has been extremely rewarding and we really thrive with the freedom. What have you learned about the entire process? What are some of the unexpected or difficult challenges and what things went surprisingly easy? S: For me, I’m not exactly a business-minded person, so it’s been tricky for me to try and balance creativity with business..
E: Don’t do everything yourself. If you can, hire people that are more qualified and better than you at the hard tasks. Keep your focus on what you’re best at. So after all this, will you self-release another album? As you’re now based in Nashville, what is it about the city that has inspired you to become the songwriters you have become? How has it given you the “freedom” you’ve sought? S: Hmm.. Well.. It’s such an inspiring city. There’s so much talent, and we’ve formed friendships with a lot of like-minded artists. We’ve definitely been pushed to up our game here! Elle, you are quoted as saying, “Nashville is a place that sharpens your artistic senses. More than anywhere else, it makes you aware of the flaws in yourself and the areas that need improvement.” What were some of these areas that needed “improvement”? E: Dimension, perspective, experience, even keel. So are these realizations what you, Shealeen, mention as “(d)ays of discouragement, inspiration, excitement and frustration”? Is part of it the fear of starting all over again? S: Yes. It’s been a long road for us, lots of change, lots of disappointed hopes. We just try to keep the faith and keep going. It’s been way hard to start all over in a sense. So what does Pretty Speeches mean to both of you? E: It’s from a lyric in “Enough Messing Around”. We felt like it summed up a lot of the subject matter. S: To me, Pretty Speeches is a compilation of songs that are special for different reasons. They all represent different moments in Nashville. They make me think of different friendships, relationships, and moments. Lyrically and musically. Final question of this segment, do you see yourselves staying in Nashville for the long haul or are there other places you would like to live to further broaden your music careers? E: I love traveling. I’ll definitely try out as many places as I can. I really love to explore. I’ve been to almost every state in America. I still need to check out Alaska. also I’d love to visit Australia. S: We’ll see! I don’t really make a lot of plans. I’m content in Nashville for now! S: The chords in “Love Me Tender”. I learned them recently. S: I used to love it before I lived here. Now I’m on the fence. S: The “We Are Family” dance routine we did at our family reunion in 2002. S: Ray Charles singing “America The Beautiful” in the Sandlot. S: A band name for sure! Super original, I know! Poema’s Pretty Speeches is available now. Get it at their online store, iTunes, Amazon, and eMusic. Follow Poema on their Website, Facebook, Twitter, and Instagram. Cover photo by Mikaela Hamilton. The remaining photos by Austin Lord. Special thanks to Bullhorn Publicity.